At the International Manufacturing Technology Show (IMTS) 2016, it was clear that 3D printing was no longer a tool for prototyping, but something capable of aiding in the manufacturing process—whether it be the 3D printing of tooling or end products themselves. All of the established industry leaders sought to demonstrate the technology's capabilities in the larger manufacturing space, including Optomec, which made an important announcement that could see the price of metal additive manufacturing (AM) drop and, therefore, have its reach extend into the production supply chain. Optomec unveiled a partnership with Fryer Machine Systems to integrate Optomec's existing laser engineered net shaping (LENS) metal 3D printing process into Fryer’s computer numerical controlled (CNC) machines to create systems at a lower cost. To learn more about the impact of the partners' new machines, ENGINEERING.com spoke with Ken Vartanian, vice president of Marketing, for Optomec. Based out of Albuquerque, N. Mex., Optomec is a pioneer in both the fields of directed energy deposition (DED) and electronics 3D printing. After the invention of the LENS DED process at Sandia National Laboratories, Optomec began commercializing the technology in 1997 before also commercializing its Aerosol Jet electronics 3D printing in 2003. The LENS process directs metal powder into a melt pool formed by a laser beam. Working with such metals as titanium, stainless steel and Inconel, LENS can be implemented to repair existing metal parts or as a method of manufacturing parts. Aerosol Jet involves the atomization of a given electronic ink into a fine mist, which is then sprayed through a very fine nozzle by a focusing gas. Aerosol Jet technology is capable of extremely high resolution printing, which was demonstrated recently as Optomec achieved micron-scale printing. Additionally, Aerosol Jet can use a wide array of materials, from organic substances to adhesives to conductive inks. Optomec has become an established leader in both metal 3D printing and electronics 3D printing, expanding its LENS and Aerosol Jet systems, steadily increasing the capabilities of its technology. The Aerosol Jet machines have gone from three to five axes of control so that conductive inks can be sprayed onto complex surfaces as the substrate is rotated beneath the deposition head. The LENS machines have become both more reliable through the integration of quality control software and sensors as well as more capable, as five-axis motion has allowed for the repair of metal parts. As a result of Optomec's technology, the company received a $6 million strategic investment from GE Ventures and Autodesk in December 2015. Vartanian pointed out that metal 3D printing technology has some obstacles to overcome before widespread implementation can occur. Like many of the industry respondents in ENGINEERING.com's interview at RAPID 2016, Vartanian explained that cost was one of the biggest inhibiting factors, with many metal AM machines offered at prices starting at $500,000 and some exceeding well beyond $1 million. Further costs are accrued due to the fact that operators must be trained to learn new machines. Another issue stems from printers being closed both in terms of architecture and access to third-party materials. While many firms may wish to grab hold of metal AM to keep up with existing trends, these barriers make it difficult to justify bringing the technology into existing operations. That's where CNC manufacturing comes in. 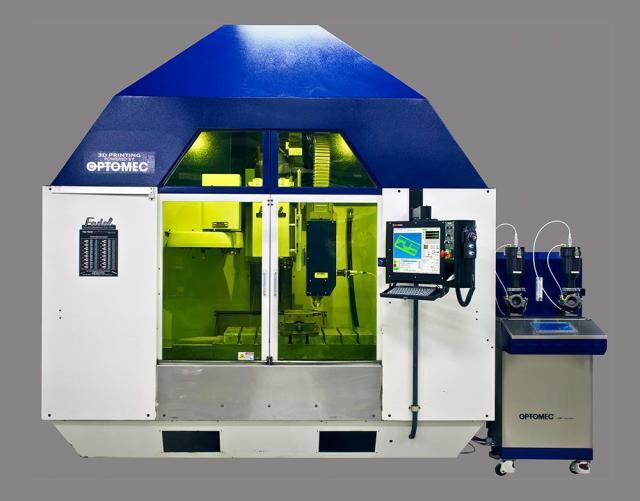 Thanks to a 2014 grant from America Makes, the U.S. AM institute, Optomec was able to fund research to retrofit existing CNC equipment with its own LENS deposition heads. In June 2015, the company showed off its accomplishment, a Fadal CNC machine modified to use the LENS system. In addition to lowering the cost of the system and expanding the reach of Optomec’s metal AM, the firm found that the new hybrid device could be operated using the same toolpath codes featured in standard CNC mills, making it that much easier to integrate into existing machine shops. With this new, modular LENS Print Engine developed, Optomec looked for the right CNC manufacturer to begin selling LENS-capable machines. The marriage of CNC and 3D printing is a natural one. In addition to existing hybrid systems developed by companies like DMG Mori and Mayzak, many desktop 3D printers were directly inspired by the CNC mills used in makerspaces around the world, leading both technologies to often rely on the same toolpath programming. It should be no surprise, then, that existing CNC manufacturers are now jumping into the additive game. After toolmaker Cincinnati Inc launched the Big Area Additive Manufacturing system with Oak Ridge National Laboratory, CNC producers Thermwood and Ingersoll followed suit with their own large-scale systems, both of which have built-in CNC capabilities. For Optomec, the partner of choice was Fryer Machine Systems. Together, the partners have released two separate lines of products under each firm’s respective brands. 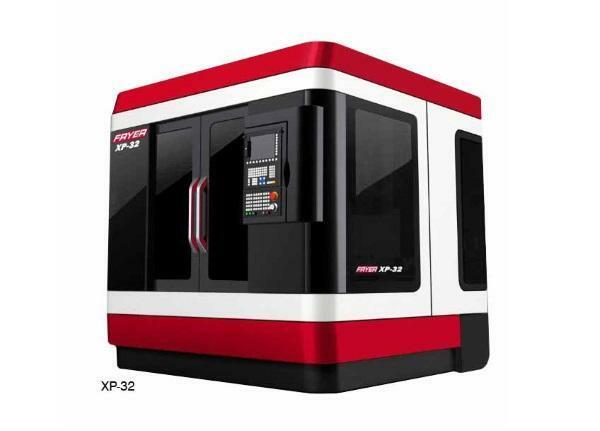 Fryer has retrofitted its XP Series of vertical machining centers (VMCs) to use the LENS deposition head and powder feeding systems to create the new LaserFab 3D Hybrid Machine Centers, the least expensive of which sells for less than $350,000 and has an ample build volume of 24 in x 18 in x 18 in (61 cm x 46 cm x 46 cm). Build volumes for other machines in the series are as large as 45 in x 24 in x 25 in (114 cm x 61 cm x 64 cm). Optomec's new LENS Machine Tool Series, from left: 3D Metal Hybrid VMC without inert gas, 3D Metal Hybrid VMC with gas chamber and the 3D Metal Additive system. Optomec, too, has announced a new series of systems dubbed the LENS Machine Tool Series. Based on the Fryer Compact Mill (CM) CNC platform, these machines are available in three configurations, a purely additive machine, a hybrid system and a hybrid system with a gas chamber for processing reactive metals and aluminum. These systems have a somewhat smaller build volume of 20 in x 14 in x 20 in (51 cm x 36 cm x 51 cm). While these machines don't feature simultaneous milling and printing, they do have a 1.5-second 24 tool ATC (automatic tool changer) so that, when printing is taking place, the milling head moves out of the way and vice versa. Other important features include the powder feed system, which is capable of high speed but has a steady powder supply, and built-in process control. This latter feature is not prevalent in the metal 3D printing industry, where manufacturers often provide visual monitoring of the build chamber and related reports, but not actual closed-loop control. With Optomec's SmartAM closed-loop melt pool, a sensor monitors changes in the melt pool during the build and automatically adjusts laser power to keep the process in control. This compensates for the heat built up from each layer and ensures that the microstructure of the printed metal is consistent throughout a part. According to Vartanian, metal 3D printing is entering the mainstream manufacturing space at an accelerating pace. He explained that many smaller machine shops are eager to adopt and understand the technology before the rapid pace of innovation puts them out of business—a fear made that much more prominent with GE's recent acquisitions. Optomec and Fryer's new systems drop the cost of DED technology by half, potentially making it much more accessible to small machine shops and even more accessible to the GEs of the world. Added benefits like in-process quality control and usability are just the icing on the cake for those in the manufacturing industry. Vartanian envisions the technology being used to extend the useful life of metal parts, remanufacture and repair obsolete components and to fabricate more efficient end products used in the aerospace, defense, automotive, and medical equipment industries. Beyond that, however, the full potential, Vartanian believes, is still to be determined. “What will access to new technology like this do to the world of manufacturing? We believe additive manufacturing will provide transformational gains in productivity across the product lifecycle from designs with lower part counts to reduced manufacturing steps and to more reliable and easier to maintain end-use products,” Vartanian said.